The world discovered the Reva NXR at the Frankfurt motor show about 3 years ago, and to all the journalists who were there (myself included), it was an instant hit. Reva had already proved itself with its first model, but its poor design had kept it from the interest of affluent buyers. With much better styling, the Reva NXR promised way more, but it was also a difficult promise for a company the size of Reva. Much more sales were expected, much work and investments were needed to complete the car’s development and boost production, to make those ends meet, Mahindra, one of India’s largest companies, took control of Reva. We shall now speak of Mahindra Reva, a company which is now in its starting-blocks after the inauguration of a brand new factory. This plant received a Platinum award, which is the highest rating a building can get in India for green building. That was the first time an automotive factory got it. This new plant has a capacity of 30,000 cars a year, with production starting this September. They shall begin with manufacturing 500 cars a month, because a lot still needs to be done in establishing an international sales network. First export markets should be China and Norway, and availability in other western European markets may take more than a year. But there are opportunities in France and Italy for a cheap and compact EV, and Chetan Maini assuredly knows this. Never heard of Chetan Maini? He’s the engineer behind Reva. With more than 20 years experience in electric mobility, he’s an automotive visionary all EV enthusiasts should get familiar with. 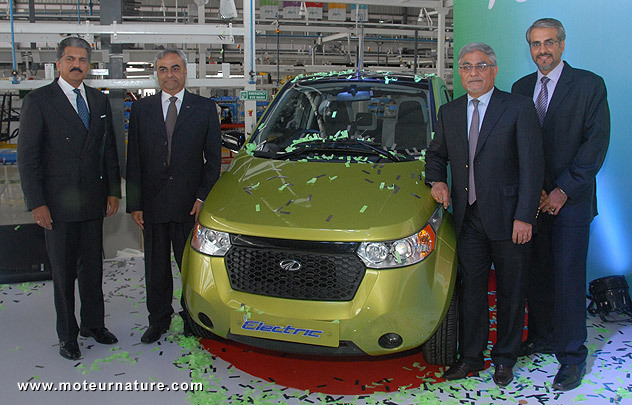 The latest e20 electric vehicle from Mahindra Reva electric car company has been recently creating a lot of buzz in the present-day’s electric car industry, and the EV is expected to stand out as the best selling for the automaker in the coming days. Well, I’m waiting for it.